Apple made their keynote presentation at the World Developers Conference 2017 yesterday, and among many other reveals — like new iPad Pro models and the Apple HomePod speaker — was the announcement of a suite of augmented reality tools the company has dubbed the ARKit. The aim for their new platform, simply put, is to provide more robust augmented reality capabilities for iOS devices, and the company showed off these possibilities by live-directing a short piece of virtual action on-stage using an iPad. 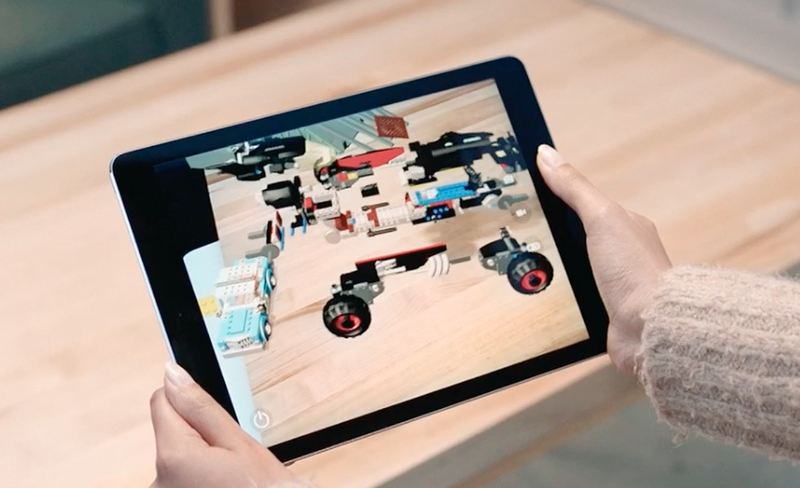 That's not all the ARKit is capable of, however, and we've got a keen look into some of the possibilities Apple is imagining with AR on iOS devices. Up until very recently, the Apple iOS mobile operating system didn't offer very much support for augmented reality. Perhaps Apple didn't find it particularly interesting. Regardless, the popularity of AR-enabled apps like Snapchat and Pokemon Go have gotten app developers curious into the capabilities of AR, which has lead Apple to start building their ARKit platform. When compared to Google, Apple is a little behind the curve: Google has had their own Tango AR platform for quite some time. However, Tango is only available on select Android models running select Android distributions, which means Apple's ARKit — which is slated to run on the latest iOS 11 — is well-poised to become what Apple's Craig Federighi calls "the largest AR platform in the world." Among the headlines for Apple's ARKit are a few basic goals: the first and most obvious is stable motion tracking. Apple calls this "world tracking," though technical types would prefer the term visual-intertial odometry. This is technology that uses the device's cameras and motion sensors to track the user's movements within an environment. Without being able to accurately track motion, there would be a severe disconnect between what the user sees on the screen and any objects the device is trying to place on-screen. Also extending this notion are plane estimation and boundary definition, both of which are needed to accurately place models on-screen. Apple's other stated goals for the ARKit are obvious: both ambient lighting estimation and scale estimation are needed to make on-screen models appear to be part of the scene they're being projected into, and both help complete the illusion that an effect or scene is playing out in front of the user. Apple has also stated plans to support Unity, SceneKit, the Unreal engine, and Xcode app templates, meaning developers can make use of any development platform they prefer. There are loads of cool opportunities for augmented reality technology, not the least of which is finding a way to jazz up indecent photographs. Apple referenced an upcoming app from Ikea that will likely be used to place virtual furniture into a user's home, meaning potential customers can get a sense for the look, feel, and scale of a piece of furniture before making a purchase. Also, since augmented reality software relies on tracking the user's environment, some of the most basic software can be used to 3D map rooms and buildings. This is something that's already possible through Google Tango, but since Tango relies on more specialized cameras, there's no word yet on whether or not this type of functionality could land on iOS devices. Lastly, AR shares many features in common with VR, namely user tracking and environment mapping. Google's Tango AR platform has already been used in Google's standalone Daydream headset, and given that the new iPhone 7 will be loaded with two cameras and more robust depth sensing, Apple's ARKit may be a valuable stepping stone toward a dedicated virtual reality platform. Aside from pushing the boundaries of mobile technology, the iPhone is also a fantastic gaming device. Check out some of the epic and addicting titles we've featured on our list of the Best iOS Games.